Montezuma's Return! might go FLOSS! Montezuma's Return might see it's source code released under a FLOSS licence! This is a serious issue, not only because most of us here believe in free, libre and open-source software, but also because this video game doesn't work on modern systems or even via DOSBox. Last year, I contacted one of the original developers of Montezuma's Return (Rich Geldreich) to know if the source code could ever be released. Basically, the answer was "yes, but" since the copyright of the game is divided between different people, all parts must agree to change the licence. Rich and I discussed it via email about it until September 2012. The main idea was to inform you, the public, that the game could go FLOSS to see if the reaction was significant enough to convince one of the copyright holder: Rob Jaeger. A few days ago, Rich contacted me to say he was pursuing his efforts along side with Gary Corriveau (one of the original designers/artists) to convince Rob to agree on releasing the source code as FLOSS. Therefore, I would like to know if a call for showing support is worth an article on the freegamer blog or not. Re: Montezuma's Return! might go FLOSS! Sounds cool, however with and relatively obscure title that old (although I actually remember playing it quite a bit back then) it would be relatively important that the art assets are also released, at the very least under a freeware license (but good creative commons license, e.g. not NC or ND would be of course better). This actually a good idea since the game is, indeed, hard to find and since there's a lot of different versions of the game. I submited the idea to Rich, he'll tell me if it's possible. I think this would really have some potential if released under a FLOSS license (along with its data, as pointed out by Julius). Sorry to resurrect an old thread, but the idea is still alive. 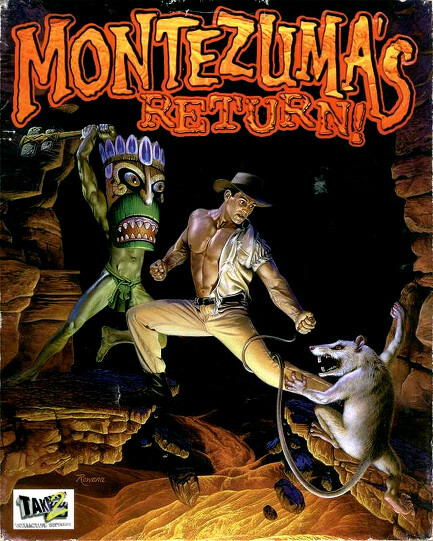 I'm actually looking for a way to gather people and make a petition to ask for Montezuma's Return! source code to be released. If Rob Jaeger needs to see people caring about his game, I think this is a good idea. Can the FreeGamer blog give a hand? Or just put this post as sticky? Do you think you can help? And how? Hmm... I wonder... why anybody would ever need the source code for 1983 game? I'm not experienced in real-time games / and absolutely no experience in platformers... But I see nothing 'special' in it. The game logic is very simple its much more about that old graphics, which should be replaced by quality assets & graphical engine in case this game is meant not only for very-old-persons for nostalgie. It seems that it's much easier to write it from a scratch, especially in case of some game engine, than to port some ancient code. IMHO. Or do I miss something and it's about some rather modern creation? This looks awesome. Never played it, but definitely will if it goes FLOSS and gets ported. Hey, shame I only stumbled upon this thread just now, and not a few years earlier. There used to be an active, although small, speed running community around this game which I believe has winded down in the past few years. I'm sure if the game was made FLOSS the speed running community for it would come out of hibernation, especially since that would mean that it would be possible to improve the controls of the game. Mainly I'm thinking of the mouse look feature which I believe was added in a patch after release. This is one of my faves from my childhood and I keep discovering new little secrets around it. It would be amazing if the source code were released! Mods, custom levels... Maybe next year, 20 year anniversary of this game, we'll get word back from Jaeger. This truly is a hidden gem.